For many (if not most) beekeepers, harvesting honey is one of the most enjoyable times of the year. Your bees survived the winter or you got new bees in the spring, you tended them with care through the summer to make sure they were happy and healthy. If you are lucky, they made enough honey to get them through the next winter and maybe a little (or lot) extra for you to to enjoy as well. If they did, then late summer is harvest time! 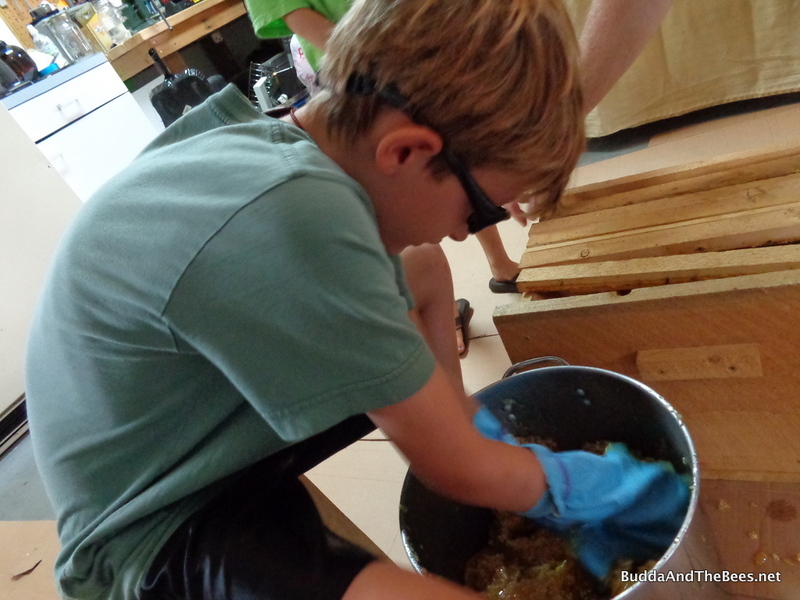 Before I started beekeeping, I didn’t think much about honey, nor did I eat much of it. 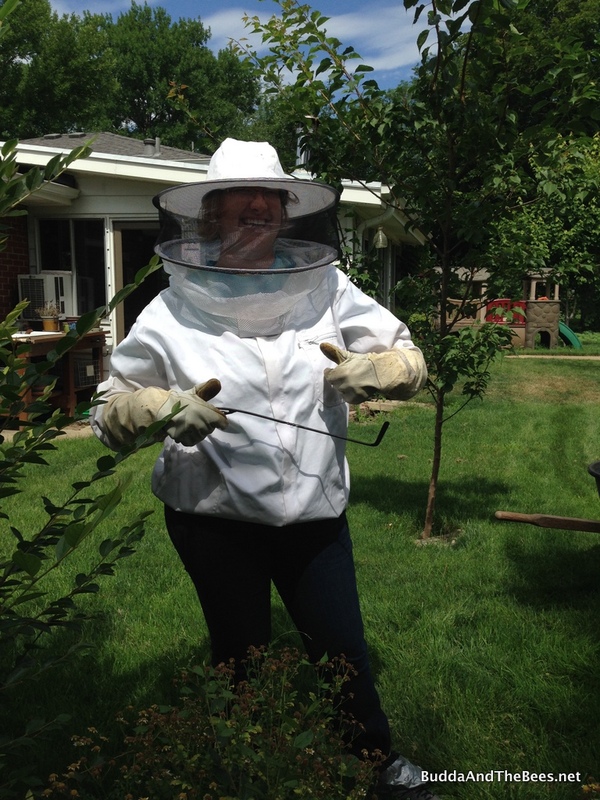 Even now, my primary purpose for beekeeping isn’t to get honey. I’m more into it as a way to help pollinators and connect with nature. But I do know that some people, like my colleague Kelly’s son Cal, think it’s one of the best things in the world. 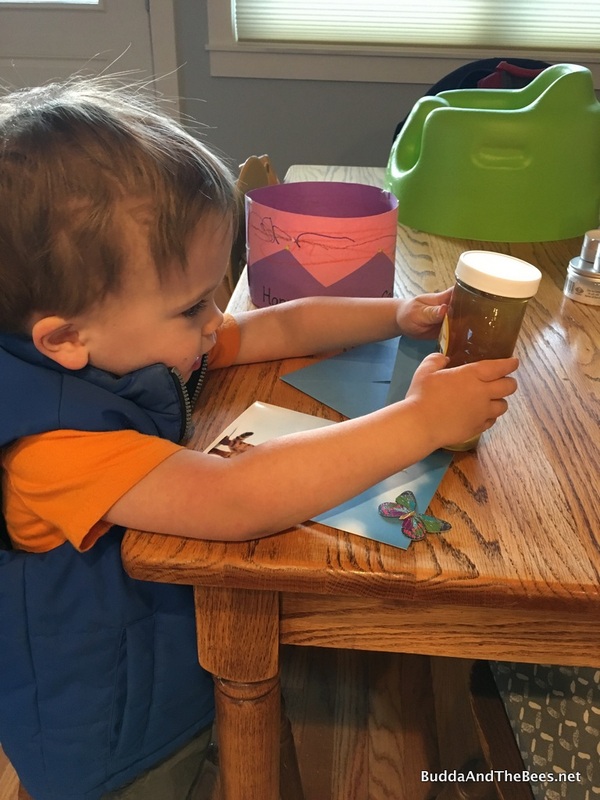 Here he is with some honey I gave him for his 3rd birthday. One mistake that some new beekeepers make is harvesting more honey than they should, especially the first year. Bees need the honey for food during the winter months, and if you don’t leave them enough to make it through the cold weather, they’ll starve before spring. In Colorado, we can have late spring snows when the flowers are just starting to appear and the bees rely on the surplus honey to make it through these cold snaps and possible loss of forage from the snow. For example, this past spring, we had a late freeze which killed all the fruit tree buds, right around the time that the bees needed that food source. I tend to leave more honey than I need to in my hives (at least 16 total bars in my top bar hives). I figure that if they don’t eat it all, I can harvest what they don’t need in the spring or use it to feed splits and caught swarms. I don’t feed my bees sugar – honey is a much better food for them. 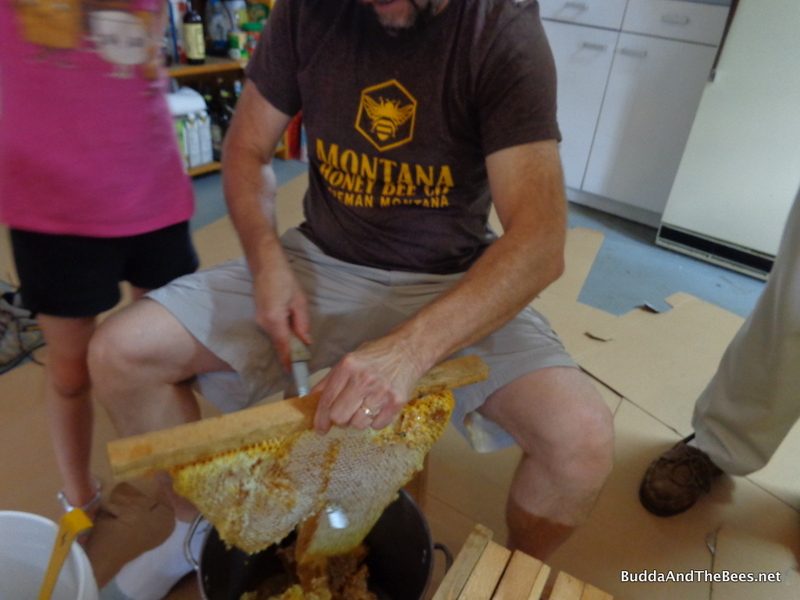 While harvesting honey can be fun, processing it can be tedious. In the crush and strain method I use, I have to cut the comb from the top bars, mash it all up and strain it. Then I have to bottle and label it. In the process, I end up with honey over most surfaces in my kitchen – counters, door handles, floors. It’s quite a sticky mess. This year, I decided I’d break up the tedium by inviting people over to watch the process and help out. It’s a good excuse to get people together and give them treats – something my wife and I love to do. I’ve had Duncan and his family over to help in past years, but this year I expanded it to others. I knew my little buddy Cal would be into it. 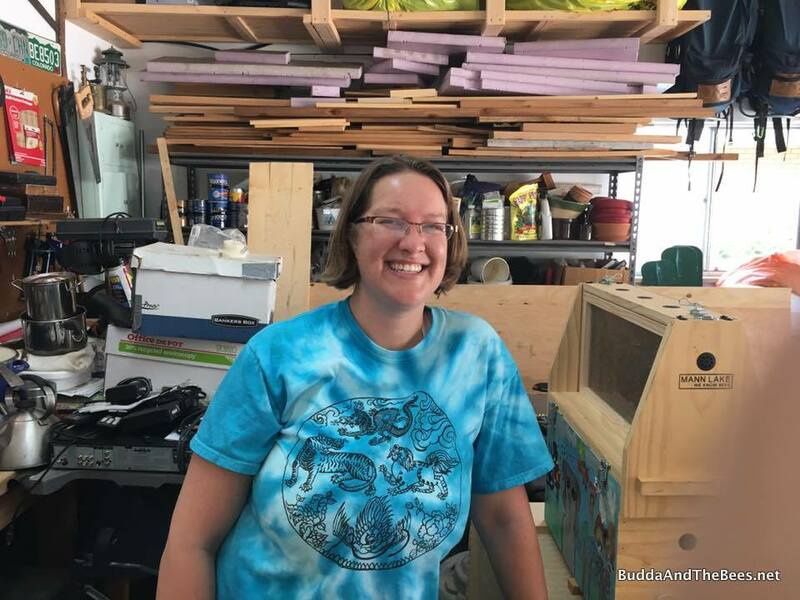 In late July, Laura’s hive filled up all the bars in the hive so I needed to take out some honey or else the bees might swarm. 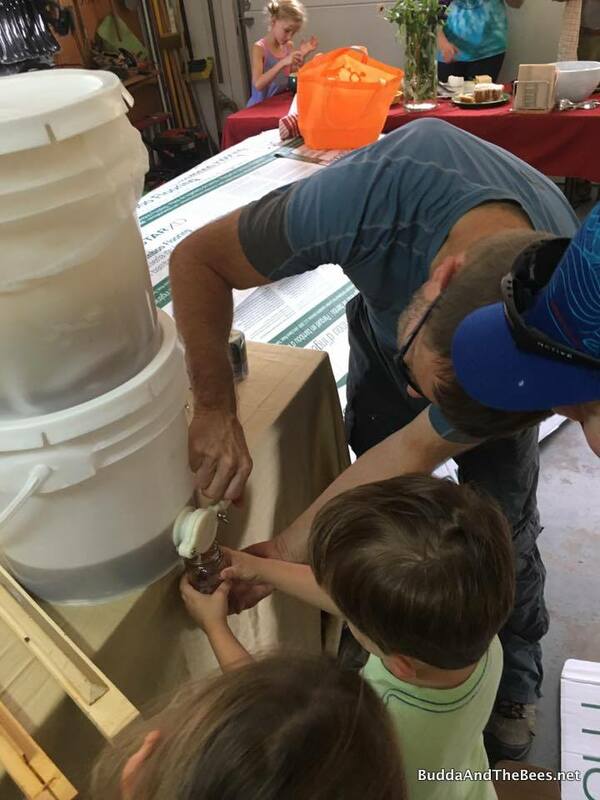 I invited some friends over (including Cal and his family) to help out processing the honey. I set up the observation hive too, so the kids (and adults) could play find the queen. 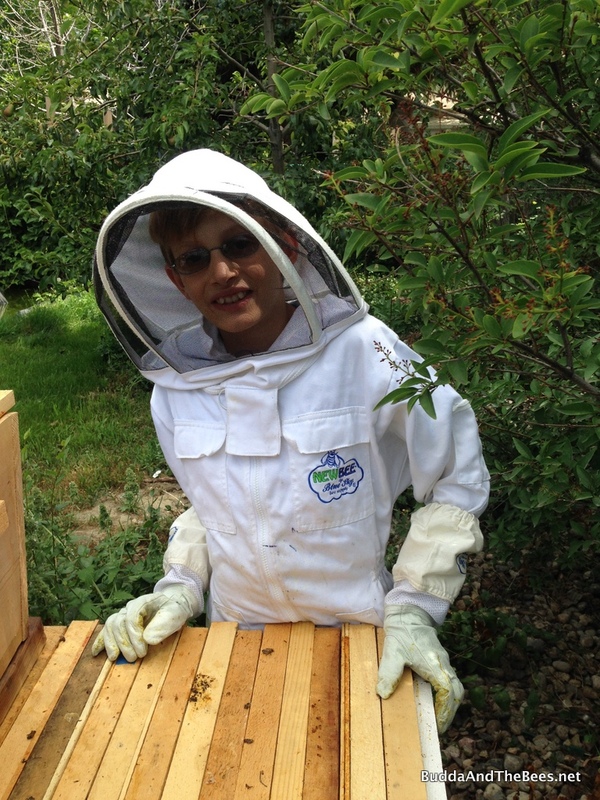 To avoid unwanted stings, I pulled the frames out of the hive before most people got there with my helpers, Duncan and Karvari. Karvari ready for action with her cool hive tool. I always think I have a good plan for harvesting that will make it quick and easy. My plan was to harvest 4-5 combs, brush all of the bees off, put them into a nucleus hive and then cart them back down the street to my house. The combs at the very back of the hive were full of unripe nectar, so I had to temporarily move these to the nucleus hive, which I hadn’t planned on. Karvari had brought her cool hive tool and a bee herder device to move the bees off the combs. While the hive tool was great, I decided it would be easier to just shake the bees off the combs instead of using the bee herder. That made them mad and they got a bit defensive. One went straight for Karvari and stung her on the thigh through her jeans! In addition, the bees had attached some of the ripe combs to the bottom of the hive and I made a mess trying to detach them with a homemade tool I had (note to self – have to get a better tool for this). Honey was dripping into the hive, bees were drowning in it, angry bees were flying all around, so my best laid plans were thwarted. We persevered, and eventually, we did get 5 combs out and into the nuc, and most of the bees stayed behind. My honey house is just my garage (or basement, depending on the day). I clean up the half where I do the processing first. We had new wood floors installed in house this summer, so I had leftover cardboard boxes that I put down of the floor, in hopes of making this a less sticky process (or at least to make cleanup easier). All the equipment gets washed and sterilized beforehand. I was trying out a new harvesting bucket this time – one where the top bucket has holes drilled in the bottom. The crowd arrived about noon and we set about our business. First we cut the combs from the bars. Next, the combs were crushed up. Duncan is an expert at this and this year came up with the excellent idea of putting rubber bands on the gloves so they wouldn’t drop down. Then the mash gets poured into the strainer in the top bucket. Then we let it sit. While we were waiting, we had a honey tasting of various honeys I have and looked for the queen in the observation hive. After about an hour, enough honey went through the strainer so that I could give everyone who came a little bit of yummy sweetness to take home with them. In August, BnB2 filled up with honey, so I took some combs from that and a few from BnB1 and harvested that myself. 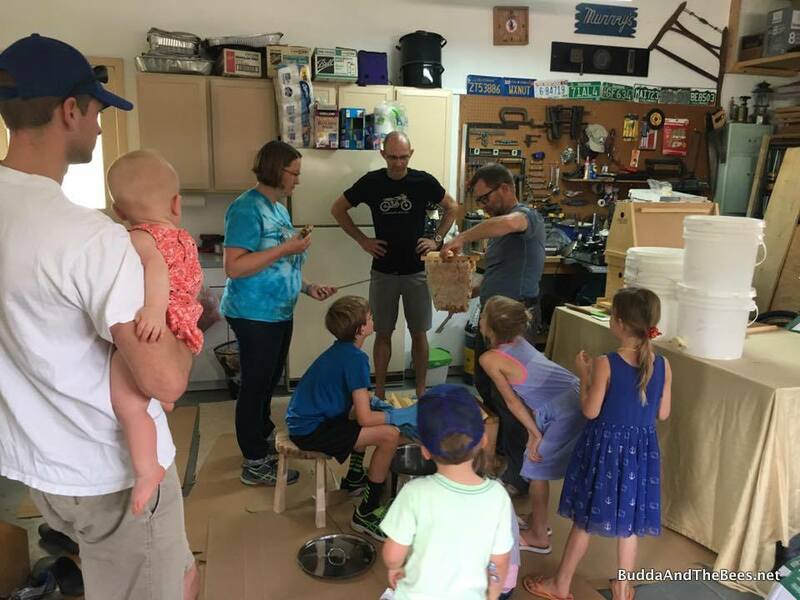 Then, later in the month, we harvested some honey from Duncan’s hive and had another honey harvest party, this time with friends from work (and Duncan’s family). Another day, another harvest (with Duncan’s sisters, Caitlin and Larry watching). 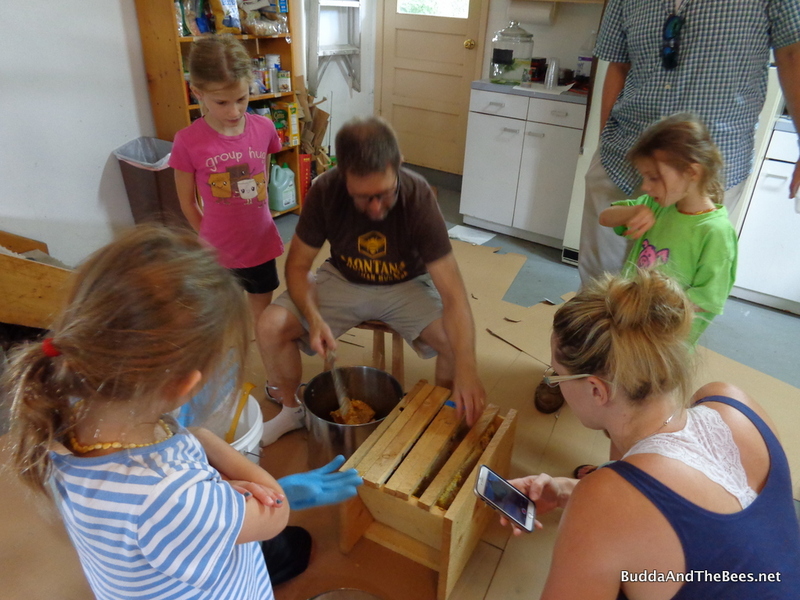 Laura’s hive continued making more honey combs, so on Labor Day weekend, I harvested four more combs from that. Duncan’s hive had lots of cross-combs in the back, so I decided to harvest some of those also. That turned out to be a mess because there were many bees in between the combs that I couldn’t get out and they ended up in the mash. In retrospect, I should have just left the honey there until spring and then harvested when there were fewer bees. This harvest was just between me and the bees and they obliged with some stings to the stomach and the cheek. 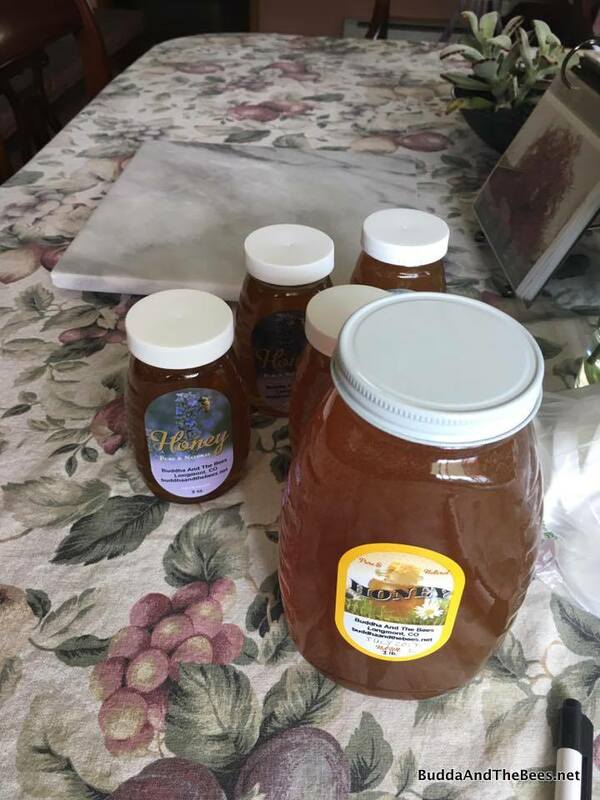 Out of 7 hives this year, 4 produced honey (Laura’s, BnB1&2, and Duncan’s) for a grand total of 84.6 pounds (about 4 1/2 gallons) (mostly from Laura’s – 35 lbs). I’ve been able to sell some and give the hive hosts their shares, but mostly I give it away to friends and family and my ashram. I love to spread the sweetness around. And I still have more! It’s never treated with chemicals and it’s pure flower nectar. I can’t ship it outside CO, but if you live here, let me know if you are interested in buying some! I gotta pay for my jars somehow! What a haul! Congratulations on your harvest! Do you have any tricks for getting the bees to make honey, or do you just have a lot of nectar all summer? Every time I see your combs, I feel like shipping my bees out to you for some on-the-job training. LOL! Although I’m not in it for honey, my bees only seem to want to make bees and not honey. This is shaping up to be another year when I won’t take honey (though I’m not alone. Even the Lang beeks are complaining that they aren’t getting honey this year.) Next year, I’m seriously thinking of switching to a different type of hive. 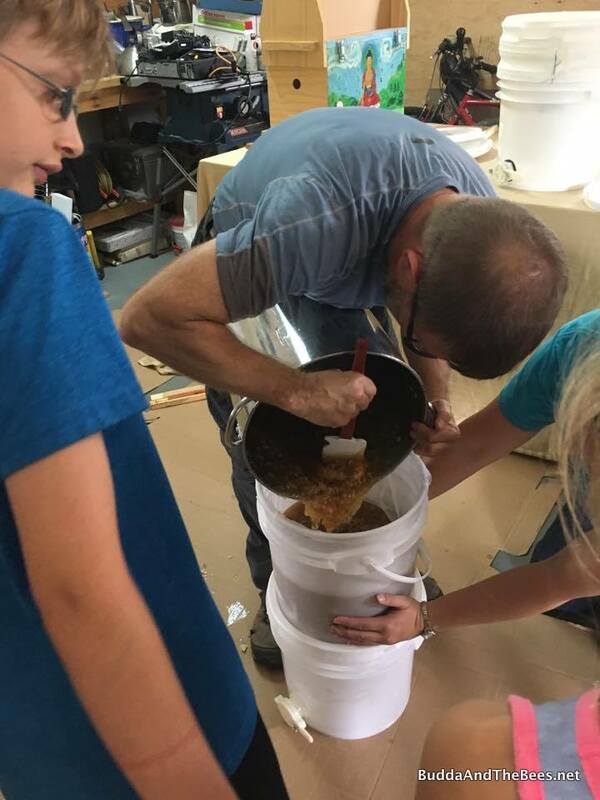 So glad everyone had a great time harvesting honey. Looks like lots of future beekeepers in the making! Next year, I’m going to try queen rearing to propagate this line. Right now I have 3 queens with the same genetics, all good honey producers (and seem to have mite resistance). If I’m successful, maybe I’ll send a couple to you! I’m not sure hive style makes a difference. I’ve had the least success with my one Langstroth and one of my top bar hives never turned the nectar into honey, even though they had a ton of it. I do think it was a good year out here. We had some late rains in early August that kept the flow going. We’ll see what next year brings! Thanks again for the great read, and happy beekeeping! Cheers! I use 5 gallon bucket paint strainers which you can pick up at any hardware store. Thanks for the links! Although our improvisation worked fine, i would like a more elegant set-up for future harvests. Cheers! So glad you were able to harvest, Don. Isn’t it a wonder how everything gets sticky, no matter how careful you are? How different our climates are just an hour our so apart is another wonder. My neck of the woods had a great May then, save one week in August, the entire summer was incredibly dry. Someone asked me to source local honey for them but I could not find anyone that had the 24 lbs they needed. Everyone I asked is just happy if their bees have enough for winter. Thanks for the advice on where to get 3-gallon buckets; such a handy size especially for small harvests. 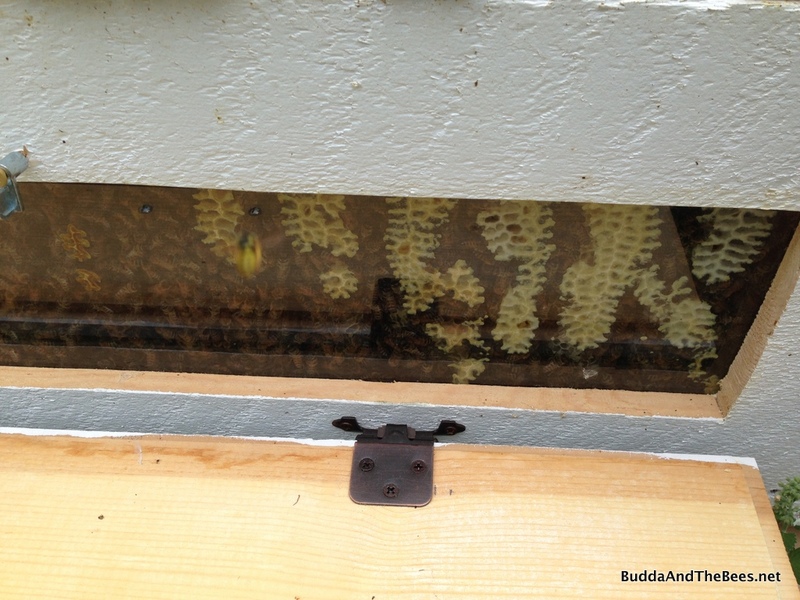 My hive is one the small side so single-comb (maybe two) harvesting is the norm. 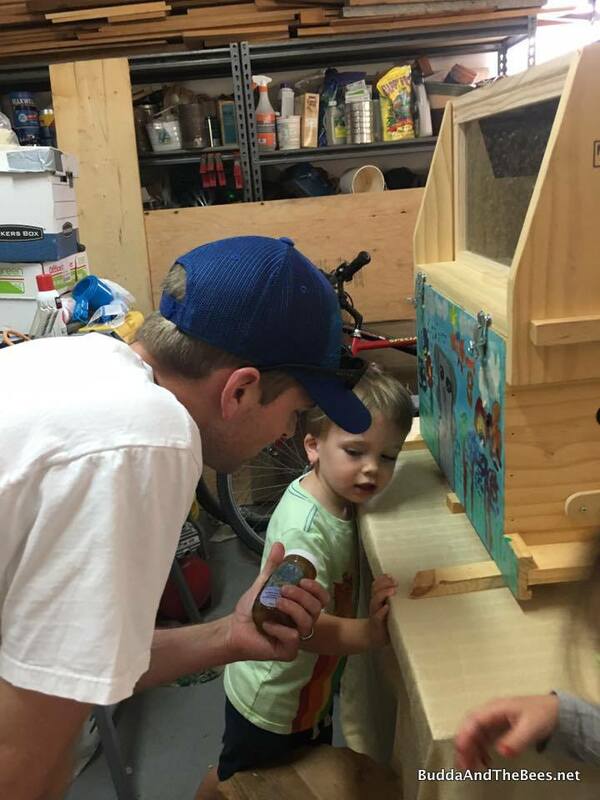 How did the kids do with the observation hive? Did they find the queen? I’m amazed that door handles I don’t even touch get sticky! The cardboard on the floor really helped with all the little ones running around through the drips. I think our weather was pretty similar (maybe a little more rain in August), but I didn’t notice in my neighborhood that the flowers were any worse for the wear even with the dryness. Maybe we all have huge water bills! Also, a large beekeeping operation about a 1/2 mile away from me is no longer in operation, so maybe my bees benefited from less competition. But the variation from hive to hive, just on my street, was pretty wide. Some bees want to make honey, some more bees! The kids did great finding the queen. And I’m getting better now that I have an observation hive! Continued good wishes that you’ll have bees next year again.